When it comes to running role-playing games, I like a fairly low complexity. I’ve got enough going on talking to everyone at the table in turn that addressing as many different questions and decision points that something as complex as Pathfinder raises is way more than I want to take on. The Storyteller system’s always been wonderfully easy to run. There are attributes and skills, you can mix and match those to address whatever a character is trying to achieve, and then you roll some dice and check for how many made the target number. 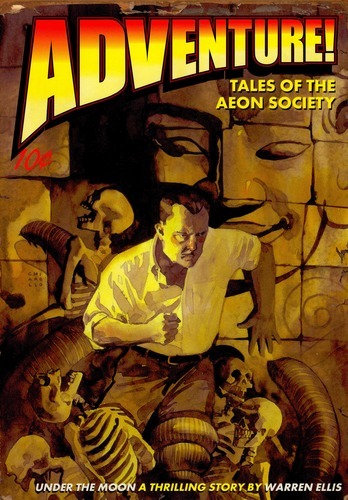 Adventure!, and its cousins in the Aeon Continuum, Aberrant and Trinity, uses a variant on the Storyteller rules. There’s a constant target number of 7 now, and additional difficulty is represented by requiring more than one success, or gaining more successes than whomever the character is working against in a contested task. So it’s really easy to adjudicate Adventure! and it’s crammed with flavorful pulp action abilities and is one of my first encounters with a meta resource for players to ameliorate dice results, Inspiration and Dramatic Editing. Player characters have a small pool of points to temporarily boost their abilities, and nudge the narrative. Depending on the GM, “Of course there are enough parachutes in this crashing plane for all of us” might just be the way things go even without Inspiration, but digging yourself out of a narrative dead end on your own abilities is almost always preferable to the GM handwaving it at the last minute because the players didn’t catch on to what they originally envisioned. With all the Pathfinder action I’ve been up to lately, I would be remiss in acknowledging what’s made it all possible. Sure, I’ve owned the core Pathfinder rulebook for a couple years now and that’s helpful at the table for referencing basic rules — did you know a rolling a 1 on a saving throw is an automatic failure? I didn’t — but between core, base and alternate classes and scads of archetype variants for each of those, the options for a game are dizzying and not easy to track. Fortunately, Pathfinder being an open game and all, there is not one, but two online resources comprising all that open content: the reference document maintained by Paizo itself and Pathfinder SRD, an independent web site. These two sites have been tremendous help in building Alexandros Callimachi and Morley Bishop. I don’t really know what I’d be playing without having the opportunity to idly browse pages in my own time, rather than scanning someone else’s book at a character generation session. At this point, with all the use I’ve gotten out of their open content, I really ought to flip Paizo some more business. The Advanced Player’s Guide? What supplement would you recommend for a Pathfinder player? The Sigillum DEI, from John Dee's Mysteriorum Liber Secundus. 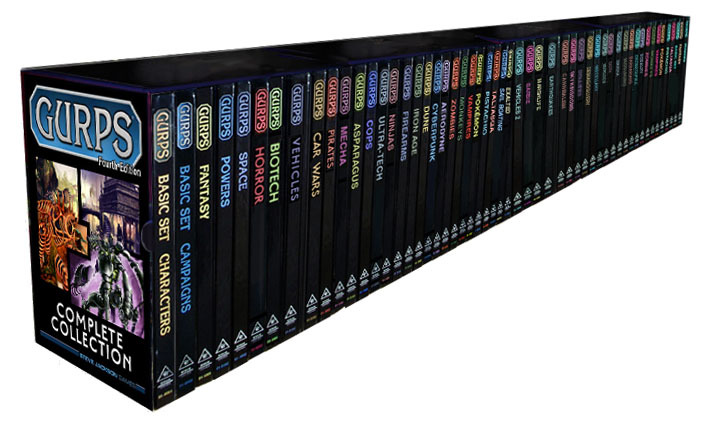 I drove myself to work on Eye of Qlippothim this weekend, mainly sitting down at the computer to continue pulling together the various bits of magic systems from all over GURPS Thaumatology to create a flexible, open-ended alternative to the standard GURPS spell system. Originally the plan was to use margin of success as the determining factor for all of a spell’s parameters: how long it lasts, the area it covers, how far it goes, all that. However, I also want to use the familiarity table for range. Instead of worrying about physical distance, a wizard has to be symbolically close to their intended subject: know them intimately or have a link to them, like a treasured lucky charm or sample of blood. If this system is intended to encourage players to accumulate lots of sympathetic modifiers, which it is, then it seems wise to prompt that upfront. Damage and duration can run off margin of success, because they should be unpredictable. But players should be able to judge with more accuracy whether their spell will hit its target, so I think it’s sensible that range work as a skill modifier, so they can figure right from the get-go what kind of bonuses they need to collect to offset penalties. In addition to a document collecting and organizing the various rules bits for this system — for which I still haven’t settled on a name; Decanic Realm magic? Hermetic Realm magic? Hermetic Astrology magic? — I’ve been working on GM screen inserts and a “quick and dirty guide to casting magic” sheet for players. One could argue I am putting the cart before the horse, creating accessories before getting the rules completely sorted out, but I’m finding it helpful. Not only do I vary the work, so I’m not constantly focusing on making all the disparate rules align, which is my least favorite part of the project, but creating the player aid helps me get the process organized in my head. I realize there are missing steps, or that it makes more sense for figuring familiarity range to go before rolling the dice, and so on. Until the rules and players collide in a playtest, I don’t think I can make much more progress on them. That won’t happen until Fall-loha at the earliest. So now I will turn back to character creation — I have a healthy list of concepts brainstormed over the weekend and I have GURPS Cabal to plunder for its own concept list — and developing the plot and non-player characters; the latter’s always a rough spot for me. I’m trying hard this time, I promise! Incidentally, I decided to do this screen in landscape orientation. Whether I buy the premade screen by Hammerdog Games or build my own out of foamcore, I think I will prefer the lower height, which allows my voice to carry and hides less of the table from view. On the downside, I’ll have to create my own front-side inserts, as there aren’t any genre-suitable landscape screens to repurpose, but that’s not a big deal. I already have some ideas in that direction. The FUDGE SRD is available for use as TiddlyWiki. That’s a clever use of the format. More games with SRDs ought to get this treatment. I know d20 and Pathfinder have. I embarked on a similar project for Opening the Dark, but got cold feet about brazenly reposting someone’s work when they took it down, OGL or no OGL. Also, TiddlyWiki as a wiki farm? That’s damn handy, as one of the “features” of TiddlyWiki is it only works locally. Barghest of RPG.net posted some typed-up notes for a Castlevania supplement to Adventure! I’m always delighted to see more material for my favorite pulp action system. It also gives some insight into the Castlevania mythos, which has always interested me, but I’ve never been willing to commit the time to digging it out of the games myself. The many Belmont family bloodlines display how farspread and varied the members of the monster-hunting tradition are. In adapting the material to the system, Barghest makes two interesting choices. The Adventure! character types are renamed to suit the premodern era of Castlevania. That’s interesting in that most people claim to disregard the divisions of stalwart, mesmerist and daredevil. Secondly, Barghest brings a video game mechanic, sub-weapons, over to Adventure!, right down to the rigors of using them: most are destroyed upon use and using them expends internal resources, Willpower in this case. I am curious to see if Barghest explains the rationale for hewing so closely to the rules of the video game in that respect.